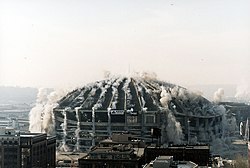 It was fourteen years ago today that the Seattle Kingdome came crashing down leaving nothing but a pile of rubble. I remember my first trip to the Kingdome. It was to see Curt Warner, Jim Zorn and the Seahawks take on the Cleveland Browns in football. Later on I would visit to watch Ken Griffy Jr. and the Mariners. The strangest visit was a spur-of-the-moment, $2 ticket purchase, to watch the Seattle Sonics play basketball from up high in the the 300 level. The players, other than Jack Sikma, all looked the same in size and height. Tiny bugs scurrying across the floor. When the ball was shot there was no visible arc. It looked much more like a blip from an old Pong game traveling across a tv screen. Ah, but what do you expect for a couple of bucks. While the Kingdome was a big thing back when it was created, at the time of it’s destruction it was past it’s prime. The Kingdome, and other multi-purpose sports arenas like it, are mostly a thing of the past. For me it is all a reminder that nothing we build here on earth lasts forever. Visiting with Cheryl tonight we were discussing some of the things that have passed on or faded during our time together. Jobs, houses, cars. Even civic organizations and church’s grow, fade and change. What hasn’t changed though is the relationships and people. It should be apparent that it is people that are worth investing in. I’ve tried to invest in people throughout my life. Some of those efforts have paid off better than others. I wrote once about a young foster child who was at one of the camps I was serving at. He and I spent hours looking in the creek for “gold” rocks. It was a memorable time spent with a child who had a rough life. I found out recently that the young child is now a 15 year old incarcerated teen. I can no longer keep up with fifty 10 year olds at Royal Family Kids Camps. For me that role has faded. But I can still keep up with one kid. So soon I will start an effort to mentor the young man that I haven’t seen since we spent time looking for gold rocks. Will this investment succeed? I don’t know. What I do know is that what society may deem as a lost cause, God sees as someone who needs a second chance.